Last week was a total whirlwind. Gratefully, it was an AMAZING week. I sure have a LOT to be thankful for! We had a very 'non-traditional' Thanksgiving. We spent it in NYC!! It was really a blast. 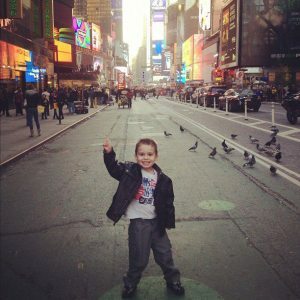 Boston got to experience the insanity of Toys R Us in Times Square. LOVED going in there-but Thanksgiving Day it was a MADHOUSE! I was expecting everything to be closed or at least on limited hours. Nope! Not in the city that NEVER sleeps! NYC was wide eyed and bushytailed!! He said hello to the zillion characters walking the streets and my husband gave out tons of dollars to get his picture taken with them haha. There really was a reason to the season. 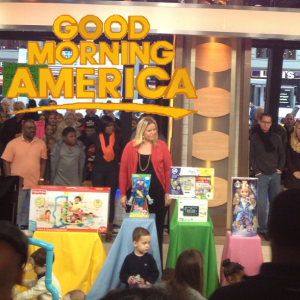 That was because I was invited to host a segment on Good Morning America about the Top Toys of 2012 expected to fly off the shelves! I'm apart of the Toy Insider Parent Advisory Panel and Laurie, the main mom behind the Insider asked if I could do the segment this past Monday. Segment on Friday? YES! Of course I could make it happen. This past summer I got the opportunity to do the Today Show. That was a lot of fun and got to give my mom an "NYC first time experience'. This one was for Boston. And me of course.. a 1st time on GMA!! I'm still unsure how it all happened. hahah. It was a whirlwind but a great time. The studio was LOADED with people everywhere. It definitely threw me off at first because I'm use to doing segments without an audience all around. But the folks in there were great. Not to mention...Josh Elliott was awesome! I hope I get the chance to return. It was a life highlight...AGAIN. Gotta tell ya... 2012 has turned out to be one AMAZING year. What toys are the must haves in your house this holiday season?